Chairman, Ian Payne, welcomed the 28 members present plus our speaker Dr. Linda Makepeace. Last month we heard of the sad loss of Phil Munson –some memories are on page 2. Absentees included Reg Baker (hospital check- up), Andrew Kellard (attending a funeral), Roger Gourd (polling station official), Arthur Trunchion (improving), Hugh Roberts (he and his wife are both ill), Richard Majewski (wife ill). Please contact our almoner, Andrew Kellard on 01737 554055, if you, your partner or another member is unwell (also temporarily for lunches – please notify by 10.30 am the prior Tuesday). *Committee members and †Post holders (incorporating volunteers since the AGM) are as follows. Please note members are not necessarily expected to remain in post for more than two years – there are vacancies on the Committee. Linda is a geography teacher at Archbishop Tenison’s School (she doesn’t work Thursdays) and works with children who need extra help. She is a Fellow of the Royal Geographical Society. Her talks are for the Purley Overseas Trust which supports small projects by giving them money to buylocally. Linda’s talk was based on her separatetrips to the north and south polar regions. Linda went to the Arctic on a Russian trawler – four ladies to the cabin. The North Pole is all sea ice, 14 million sq. miles in winter and 4 million in summer. It suffers from global warming, pollution from ships, over-fishing and ozone depletion. On the way, they visited the Orkneys (70 islands) – Kirkwall (capital), St. Magnus Church and Skara Brae (6000 year old prehistoric village). Then Shetlands (100+ islands) formed of metamorphic rock due to heat and pressure. Lerwick (capital) is a fishing port and tourism centre and Jarlshof, an ancient settlement. Puffins were everywhere. After visiting the Norwegian coast, they finally reached Svalbard. It is Norwegian but with many Russian coal miners. Composed of sedimentary rock it’s home to polar bears (picture of mum andtwo cubs) and Walrus. Longyearbyen is the capital and Isfjorden a large fjord. The same Russian trawler took Linda to Antarctica via Madrid and Buenos Aires – ice up to 2 km thick, -40°C summer, -75°C winter (coldest -89°C). Problems as the Arctic – global warming, over-fishing, pollutants. Land was seen between ice and glaciers which reached the sea. We saw the differences between types of penguin and also their different nesting and feeding habits. Also the different types of seal. Birds included the Snowy Sheathbill which loves penguin poo, the Skua which loves penguin eggs and the Albatross. After each section, was a quiz, à la classroom, with prizes – thank you Linda. Phil was a much respected member of Coulsdon Probus and for some time was a member of our committee, and as Speakers Secretary arranged a very good variety of speakers for our delectation. 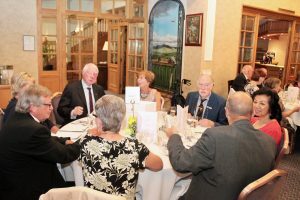 He had been conscripted into the RAF where he worked on radar – so with many members of the Club he had the camaraderie of ex-service personnel. In civilian life he was an electrical engineer. When he and his wife, Marion, moved from Coulsdon to Shoreham, they immersed themselves in the local scene becoming regulars in the congregation of ‘The Church of the Good Shepherd’, known as the church on the beach. Phil was a trustee of the local Marlipins Museum, mainly displaying the history of Shoreham, and its early film industry. He joined the Shoreham Probus Club, but only went along once – Phil missed the familiar comradeship of the Coulsdon Club particularly after Marion died two years ago – and continued to commute by train to our monthly meetings. Phil will be sadly missed by all of us at Coulsdon Probus. 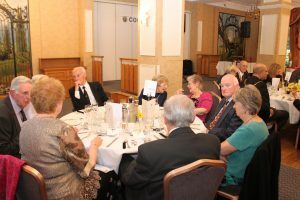 The Coulsdon Probus Society (later changed to Club) was formed on the 4th April 1968 at a lunch meeting of the Coulsdon Rotary Club held at the Red Lion. The Rotary Vice-President, Col. D J McLelland chaired the meeting, assisted by their Secretary Mr R Taylor and several Rotarians. 57 potential members of the new Club were also present. Bailey was formed and it was agreed that meetings would be held for lunch on the first Thursday of every month. 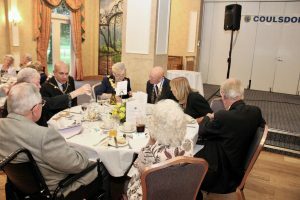 The first meeting was in May 1968 at the Red Lion, when 58 members were present, together with guests who included Mr B A West, President of the Coulsdon Rotary Club and Mr Harold Blanchard of Caterham Probus, who started the whole Probus movement. It was Caterham who coined the name as an abbreviation of the words PROfessional and BUSiness, since it comprises retired men with these backgrounds. Since 1968 a number of venues have been used, viz. The Midday Sun, Coulsdon Court Hotel, The Old Whitgiftian Sports Club as well as the original meeting place, The Red Lion. Now we meet at the Purley Sports Club in The Ridge, where the food is outstandingand inexpensive and the beer and wine are at club prices. Our annual Ladies’ Luncheonhas been held in recent years at the Chipstead Golf Club or Coulsdon Manor Hotel. In early days meetings featured after-lunch music, songs and comedy turns, but more recently these have been replaced by a visiting speaker. Our Golf section is active, visits to places of interest regularly take place and, by way of helping others, drivers are scheduled to take elderly people to their luncheon clubs. A collection at table has enabled Probus to support local charities to a considerable extent. Not much has changed in more than ten years. Unfortunately the Golf section anda Bowling section are no more and we’ve had to give up the charity driving to some extent due to insurance issues. But there is something new – our coloured brochure with a history, who we are, what we do and a membership form. 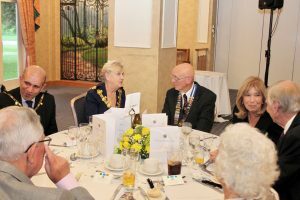 The May 2008 Newsletter reported on the 40th Anniversary luncheon held at the Coulsdon Manor Hotel on April 17th attended by the Deputy Mayor of Croydon, Cllr Brian Udell and his wife Jo and over 100 guests. Between toasts two cakes were sliced to go with the coffee and then, before the flowers, Roger Deayton gave a very interesting talk about the history of Probus. The only mishaps were the MC splitting the gavel that Tony Simpson had so lovingly made and Ian Scales dislodging a 150 year old coping stone from the front of the hotel. Others mentioned in the organisation of the lunch were Reg Baker, Jim Mulvey, Dennis Evans and Hugh Roberts, all still familiar names today. Wright, who had just retired as a Coulsdon East councillor after 28 years of service, and his wife Marlene. Also Eric Jenkinson CVO OBE, a retired member (due to ill health) and former High Commissioner to Trinidad and Tobago, and his wife Máire. 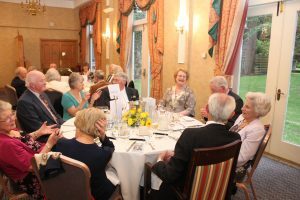 There were nearly 100 guests with representatives from Caterham Probus (the first Probus club in the world), Sanderstead & Riddlesdown Probus, Tandridge Probus, Sanderstead & Purley Oaks Probus, Warlingham & District Probus and Biggin Hill Probus. 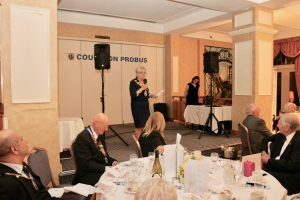 Between the main course and dessert, the Chairman gave a welcoming speech spotlighting all our guests and, of course, our own Coulsdon Probus members. Thank you to the 50th Anniversary Committee for the planning, but the main credit must go to Jim Mulvey and his wife Eileen who organised the event with their usual aplomb from our Ladies Lunches. Jim was also our Master of Ceremonies. 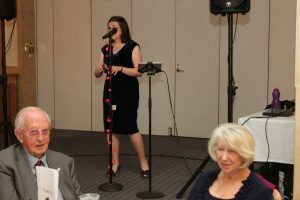 The extras, which added greatly to the ambiance and enjoyment of the event, were reception drinks, a gift of an engraved pen, our Membership Brochure proudly at every setting, our entertainer, professional vocalist Debbie Jay, the speeches and the presence of Madam Mayor. on outings and thought that as we move forward there may have to be mergers and ‘horror of horrors, we may have to admit women’. 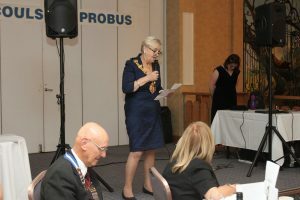 He ended with a toast to The Worshipful the Mayor of Croydon, Councillor Toni Letts OBE and her consort Mr Max Menon, AND The Future of Coulsdon Probus. Jim Mulvey supervised the draw of the main Ladies’ and Gentlemen’s(free) raffles and all that remained was for the Chairman to raffle the Table Centres, present flowers to the Top Table Ladies and to thank everyone for coming and wish them a safe journey home. Our 50th Anniversary Committee have been keen to use this opportunity to promote our Probus Club. 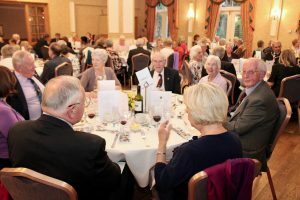 The contact with other Probus Clubs on this occasion has shown there is considerable desire to co-operate more, in particular with outings. Publicity articles with photos have been submitted to the four local Residents’ Associations, the Croydon Advertiser and CR5 Magazine. The RA’sare likely to publish in their next newsletters and CR5 in its June edition. Unfortunately, the Advertiser seems to have ignored us – unless I’ve missed it.